Kliknij na zdjęcie i przejrzyj wszystkie dostępne zdjęcia do Casa Mar Paraty. wędkowanie, narciarstwo, kajakarstwo, piesze wycieczki, nurkowanie z rurką, zaplecze do sportów wodnych (na miejscu), bar, bar przekąskowy, sauna, solarium, odkryty basen (czynny przez cały rok), lokalizacja przy plaży, transfer z lotniska, transfer lotniskowy (dodatkowo płatny), sejf, przechowalnia bagażu, usługi konsjerża, indywidualne zameldowanie / wymeldowanie, pokoje dla niepalących, klimatyzacja, część przeznaczona dla palących. Sitting in a charming fishing village and only a few minutes from both Paraty Historic Centre and Prainha Beach, Casa Mar Paraty offers and outdoor pool and free WiFi access. Each room here will provide you with air conditioning and a balcony. Private bathroom also comes with free toiletries. You can enjoy sea view from the room. Extras include a safety deposit box and bed linen. At Casa Mar Paraty you will find a bar. Other facilities offered at the property include water sports facilities and luggage storage. An array of activities can be enjoyed on site or in the surroundings, including hiking, snorkeling and canoeing. The property offers free parking. 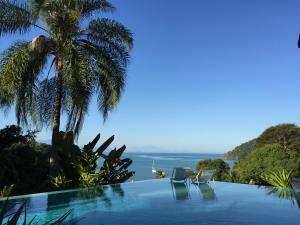 The guest house is 12 km from Paraty Historic Centre, 7.8 km from Paraty Bus station and 7.9 km from Paraty Airport.